Sustainability is a matter near and dear to my heart, so I always like hearing about brewers thinking about the future. Colorado-based New Belgium Brewing has always had a reputation for being one of the greenest breweries, so the fact that they produced the first organic beer I've ever tried is not surprising. Their first USDA certified organic beer is a Witbier named Mothersip Wit. This is also my first time reviewing a Witbier on PintLog, so let me take a minute to explain the style. 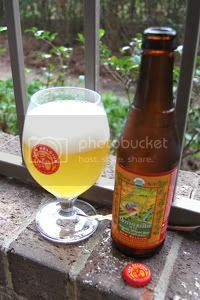 Witbier, or White Beer, is a Belgian style wheat beer usually spiced with coriander, orange peel, and various other spices. Also usually slightly sour, due to the presence of lactic acid. They are very pale in color and hazy in appearance (due to being unfiltered). Known for their refreshing qualities, these are a summertime favorite. According to the brewer, Mothership is brewed with "wheat and barley malt, as well as coriander and orange peel spicing resulting in a balance of citrus and sour flavors held in suspension by a bright burst of carbonation." That sounds just about perfect for the style, so this should be a good starting point. Appearance: Hazy and amazingly pale lemon-drop yellow body. This almost looks like lemonade as it pours out of the bottle. Nice finger and a half of white head that recedes quickly and leaves decent lacing. Great presentation. Aroma: Intense. Tangy wheat, lemony citrus, and lots of spicy coriander and cloves. With the lemon, wheat, and spices this almost reminds me of a lemon meringue pie in a weird (and good) way. Taste: Zesty lemon, coriander, and cloves still dominate over a wheat/pale malt base. Thin even for this style, I'd like to see just a little more intensity in the backbone. Not particularly bitter or sweet, Mothership is pleasantly mellow. Mouthfeel: As you'd imagine as you watch it pour, this is very much light-bodied. Good carbonation and a clean finish. Drinkability: Suburb drinkability, would quench nicely on a hot Summer day. Verdict: Although a little thin, Mothership Wit is so smooth, drinkable, and very mellow that it works. With a nice mesh of flavors and brilliant quenching potential, Mothership is another solid New Belgium brew. The fact that it's organic is just icing on the cake. This sounds like a wonderful beer that I would love, but it just wasn't. Maybe I'll try it again.